A. I want to educate and support moms during their journey to become a mother. Whether you're having baby #1 or baby #5, there is still a journey throughout pregnancy, labor, and then delivery on becoming this specific child's mother and I want to be physical and emotional support to help mom and dad feel they get the best possible outcome for their birth experience. Q Why did you choose DoulaVersity? A. The support from our mentors Trisha and Christy. I really enjoyed the in person training I was able to attend in January. It was great to get to meet everyone face to face. Then, I also shadowed Trisha at a birth in February and that was amazing. I cannot wait to learn more from them both! I never give up, even when it’s really really hard. I always try to think of a better solution to a problem. I haven’t lost my idealism, there is a better world and a better way. I’m hopeful that this determination will serve me as I serve moms. That I will help them find their own determination as they work and sometimes fight for the birth they want and deserve. A. I initially began working as a Birth photographer and found I really wanted to be able to practically help families in the birth room. I love encouraging, educating, and supporting women and their partners on the emotional, spiritual, and physical aspects of birth! A. I am local to DFW, so I loved the option to be taught by women that not only KNOW birth and actively doula, but also that know my local market. A. I love that my education is practical and evidence-based. 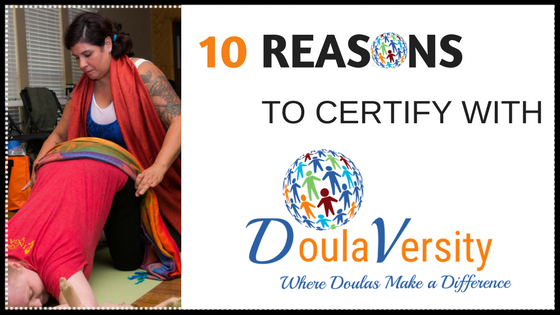 Trisha and Christy have both certified through different agencies during their time as doulas and developed DoulaVersity to bridge the learning gap of what is NOT taught by other institutions. I know I am getting a deep and well-rounded education. A. I have learned SO much through DoulaVersity. My favorite lesson is Gate Control Theory, which by itself explains the reason doulas do what they do! More than anything, though, I have learned to be confident in my own presence in the birth room. A. I always want tacos and a good gym session after attending a birth! It doesn’t matter how tired I am, there is so much excitement and adrenaline afterwards! Having a background in counseling, I am passionate about self-care. You can usually find me spending downtime hiking with my husband and tromping through lakes with our dog, Jubilee! I am an “experimental chef”, meaning I love to cook but never use a recipe . Creativity is where it’s at!